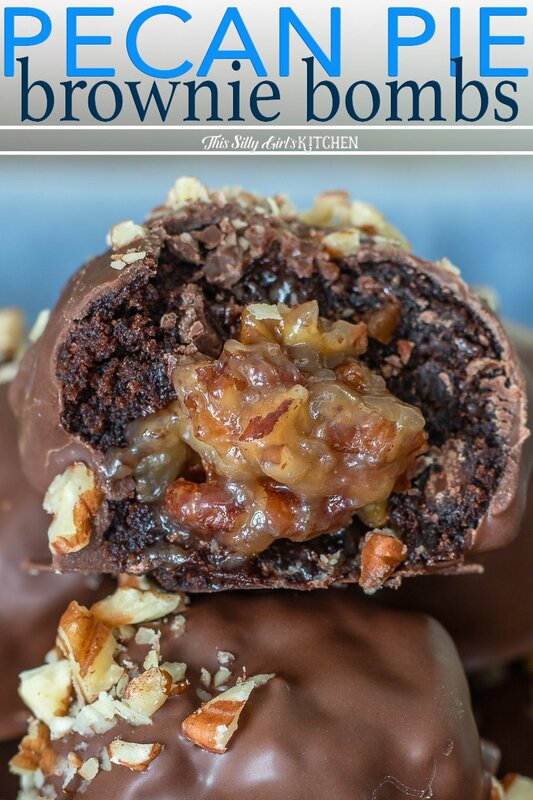 If you need an ultimate treat this season, these Pecan Pie Brownie Bombs are perfect for you! 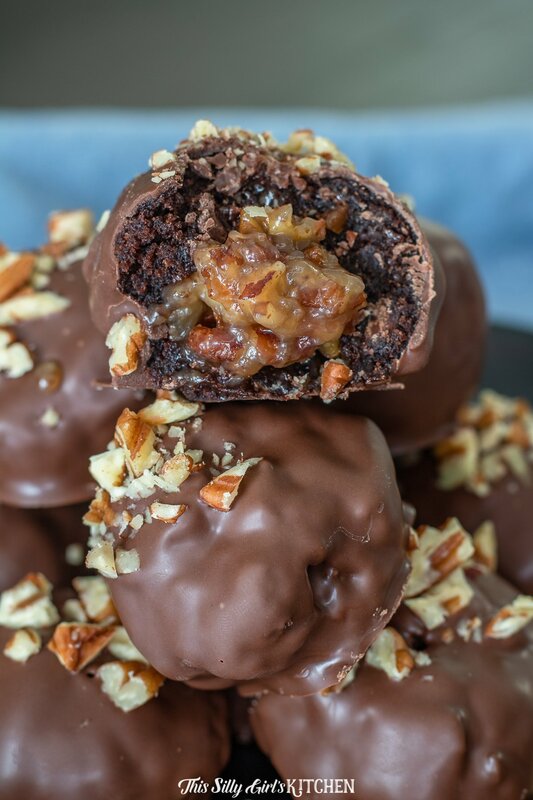 Pecan pie stuffed in brownies and dipped in melted chocolate, Pecan Pie Brownie Bombs FTW! You all have heard this multiple times, I’m a northern southerner. And, I love to take food influence from both regions of the United States. 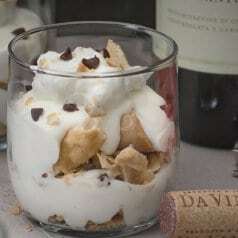 Growing up, my southern Grandma always made lots of desserts. Especially around the holidays. 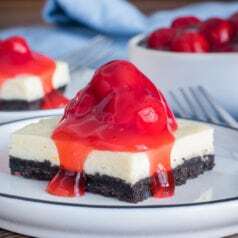 One of the desserts she loved to make the most (and we loved to eat!) were nut cups. Basically, mini pecan pies. My mother to this day makes my all-time favorite dessert, brownies! Her recipe is one passed down from my northern Grandma. 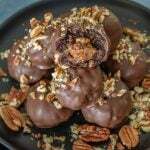 So, today I am mashing together my roots and bringing you these epic Pecan Pie Brownie Bombs! With the help of Karo® Corn Syrup… of course! There is just something about Karo® Corn Syrup you can’t get from other syrups or sweeteners. That sticky sweetness makes for the perfect pecan pie filling. Being a Chef, I have come to love it because of its quality and consistency. This is my go-to corn syrup brand because I grew up with it. Everyone in my family uses it, especially during the holidays. One person in my family has been known to chug it from the bottle. I don’t recommend… but now maybe you might understand why I am the way I am a little better now, lol. I knew I had to use Karo® Corn Syrup in today’s recipe. But, don’t think you can only use it for pecan pies… oh no. 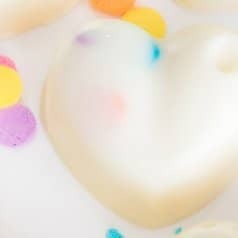 It is great in everything from fudge to cinnamon rolls, sauces, and glazes, caramels- the list goes on. With Karo® Corn Syrup’s smooth texture, it has a balanced sweetness that lets the other recipe ingredients shine. I cheated and used a boxed brownie mix, make per directions in an 8×8 pan. Or, use your favorite nut-free brownie recipe in an 8×8 pan, let cool completely. 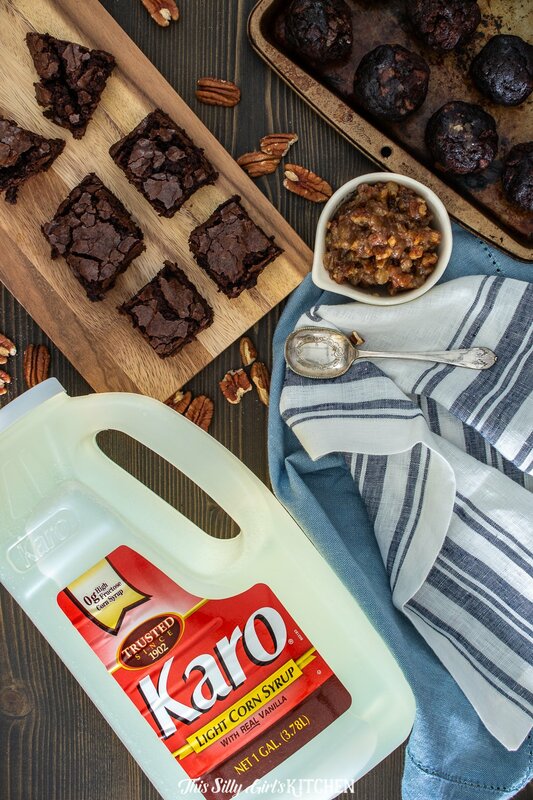 Make pecan pie filling consisting of chopped pecans, egg, butter, sugar, and Karo® Corn Syrup. Bake filling for 20 minutes, let cool completely. Cut brownies into 16 squares, flatten in hand and fill with pecan pie filling. Fold the sides of the brownie over the filling, roll into a ball making sure the filling is coated with the brownie. Place on a parchment lined sheet tray, set in the fridge for 1 hour to set. Dip each bomb into the melted chocolate almond bark. Top with more chopped pecans if desired. Place in the fridge for 5 minutes to harden. Don’t forget to pick up Karo® Corn Syrup at your local grocery store! You can find it in the baking aisle. Make brownies per box directions or your favorite brownie recipe that will fit in an 8x8 baking dish. Let cool completely. Preheat oven to 350°. Grease a 6-inch baking dish with cooking spray, add chopped pecans, set aside. In a small bowl, whisk together the egg, sugar, Karo® Corn Syrup, butter, and salt. Pour over the pecans, tap baking dish a couple times on the counter until pecans rise to the top. Bake for 20 minutes, until the middle of the pecan filling, is very slightly jiggly, let cool completely. Cut the hard edges off the brownies and discard. Cut brownies into 16 even pieces. 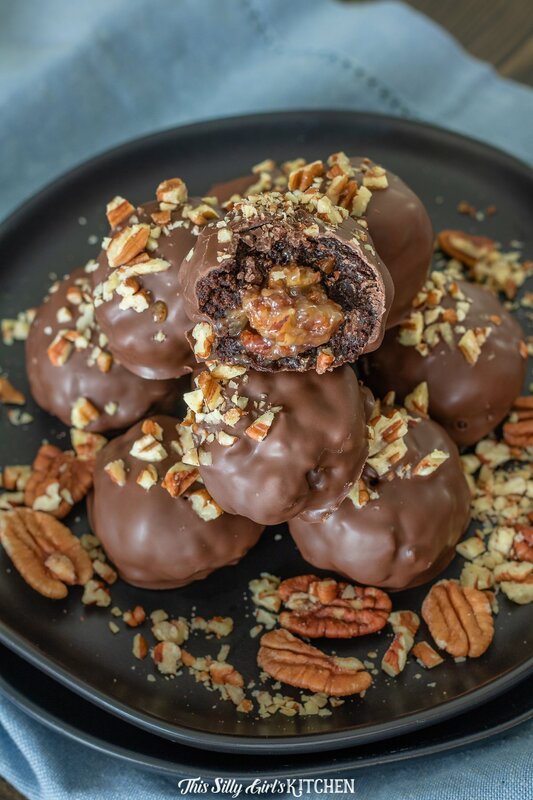 In the palm of your hand, flatten the brownie, place a small amount of the pecan filling in the center, about 1 teaspoon worth (make sure to evenly fill each brownie bomb will filling so you don't run out), wrap the edges of the brownie over the filling. Roll into a ball, making sure all of the filling is covered. Place on a parchment paper lined sheet tray, place in the fridge for 1 hour to set up. 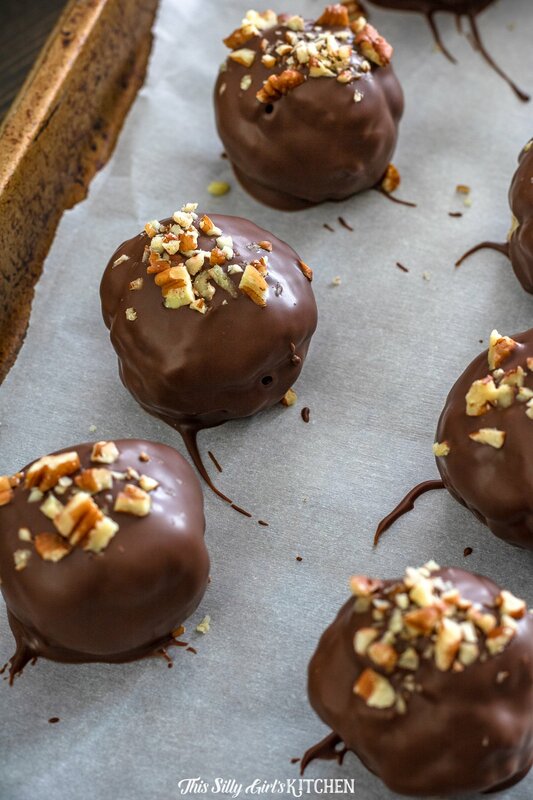 Dip brownie bombs one by one into the melted almond bark, letting excess drip off. 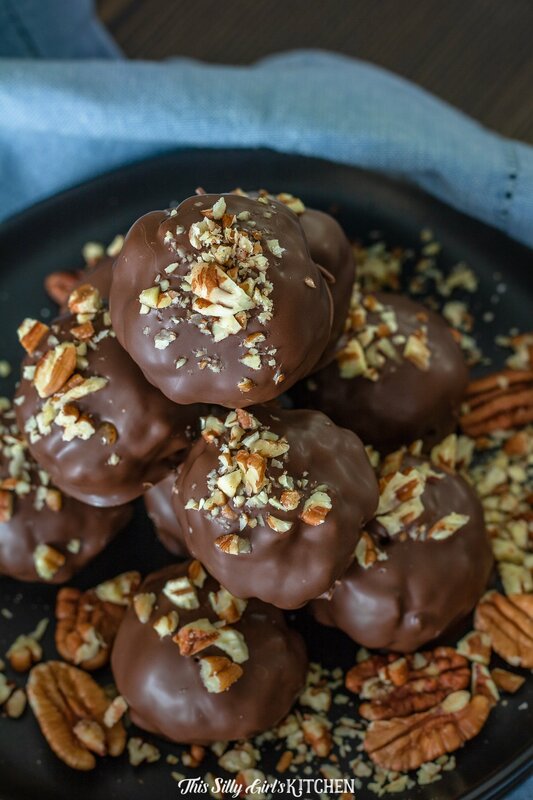 Place back onto the parchment lined sheet tray, immediately sprinkle more chopped pecans on top for garnish if desired, do this after each brownie bomb is dipped. Place into the fridge for 5 minutes to harden.